• historical pictures taken much longer ago, many in the 1920s. These are tree species natural to Perth, Western Australia (apart from one species, yate, which occurs only further south). These Perth species all extend beyond the Perth area, and this is reflected in some of the pictures. Most of the trees seen in Perth nowadays are planted ones, mostly of species that do not occur here naturally. Many are eucalypts, but native to quite different parts of Australia, such as the eastern States. The pictures on this website may help you become more familiar with what healthy, well developed specimens of Perth’s local trees look like. I find these trees beautiful, and I hope you will too. Trees like these can still be found, but are now far less common. Many, of course, have been lost as land has been developed. And sadly many that survive are in poor health; have been badly damaged by severe fires; or are affected by the drying climate associated with global warming, or by imbalances in the ecology (leading, for instance, to abnormally heavy attack by particular insect species). 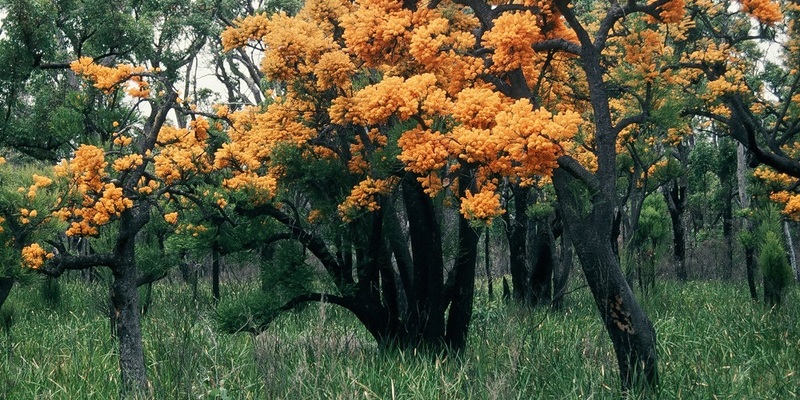 Many specimens of local species that we see nowadays are ones that have been replanted, or have regenerated in bushlands; these are young trees, quite different from the well developed specimens seen in these photographs. Local species of tree are of high value to conservation for the life they support. This includes a large number and diversity of local insects, which provide essential ecological services, such as pollination and the recycling of nutrients. They are the main food for many birds, bats and other animals. And as part of Perth’s natural vegetation, local trees are of further significance in giving Perth residents a sense of place. A few of the pictures were taken by my mother, Myee Powell, or my wife, Jane Emberson; these are acknowledged in the captions. The rest were taken by me, many in the 1960s or ’70s. Many are in black and white, an excellent medium for showing a tree’s visual character, including its shape and structure, the textures of its foliage or bark, and its abundance of detail. I began taking digital pictures in 2003. Some of these have been converted (by a good photographic laboratory) from colour to black and white, including some of the tuart and yate pictures on this website. When taking the photos, I always tried to avoid tilting the camera up more than just a little, so as not to distort the appearance of the trees too much. In most of the photos, therefore, there was originally quite a bit of foreground, much of which I have cropped out of the images presented here. A few of the photos have been edited to remove distracting elements such as road signs or powerlines. I have photographed all of Perth’s tree species, but only some, listed in the drop-down menu, appear on this site. Click on a species for the pictures of it to appear. There are more of some species than others. Please do not assume that the absent species, or those for which there are only a few pictures, are any less beautiful or ecologically valuable than those for which there are many pictures. Rather, the numbers reflect the opportunities I have had to photograph the different species, and the particular directions in which my interest has developed. I intend later to add further pictures and include some further species. • some discussion of what can be seen in the picture. The pictures’ titles comprise or include information preserved with the photograph (but often with botanical names inserted by me), including the date, if known. Dates written in brackets are estimates, based on such things as the picture’s reference number, its inclusion in a report, or its position in an album. The location or source of the picture is given just below the title, followed by its reference number. Most of the pictures are now held by the J.S. Battye Library of West Australian History (shortened to ‘Battye Library’). For those that are not, the name is stated of the body from whom I acquired my copy (mostly in the 1970s). The cameras that took the pictures were primitive by today’s standards. Nonetheless, most pictures are of good quality. Most of them, including all of those from the Government Printing Office’s ‘Series A’(now listed as Battye Library 816B/A/…), were taken on glass plates; these date from the 1920s or earlier. Most were taken by professionals, usually Government officers, for purposes such as forestry, mining or tourism. A number were used as illustrations in the ‘Primer of Forestry’ prepared under the supervision of the Conservator of Forests (see References). Some of the forest scenes were taken by Professor E.H. Wilson, of Harvard University, on a study tour of South-Western Australia. In general the pictures must have been taken with considerable care. Some are beautifully composed or lit, or taken on an unusually still day — real works of art! Most of the pictures show scenes that have since changed very visibly. Some areas, such as the tingle forests, were scarcely settled by Europeans at the time the pictures were taken, and give a good idea of what the first European pioneers would have found. Most of the pictures are uncropped or cropped very little from the original. A few are cropped more significantly to give prominence to a main tree or group of trees. Many of the pictures have slight blemishes; in a few of them very obvious blemishes, such as streaks or blotches in the sky, have been removed. Historical photographs (pre-1955): out of copyright, but for any use the source and reference number (as given in my captions) should be quoted.